If you run a small department of a business, or just track travel expenses, the Simple Business Expense Template in Excel is perfect for cataloging expenses. Track business spending easily by the week, month, or event with this template. The template can be downloaded into Excel using the link below. The page is a short, simple layout with spaces provided to help you fill in your information. Begin by adjusting the top red bar to have your business name and what the chart is tracking. Next, above the thin red line is where you enter your [Name] and the start and end [Date]s for the timeline you’re tracking. The rest of the template is for you detail the actual expenses. For each expense, type in the date, a brief description of the purchase, what type it is (Travel, Food, etc), and the amount it cost. There is also a section for notes to detail anything out of the ordinary. Once your report is finished, print and save it for your records. You should also create separate templates for each business expense report so nothing gets confused. 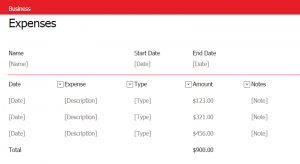 The “Total” at the bottom is automatically generated according to what expenses you enter. This way you can track how much each trip costs. In a file, keep the expense report plus all receipts together. If you notice any errors in your bank statement, you can refer to the file. Give employees this blank Excel template to fill out on their business trip or activity. This will help you put an official report together with their information and receipts.